Why did the Son of God become man? 98. What does the virginal conception of Jesus mean? The virginal conception of Jesus means that Jesus was conceived in the womb of the Virgin solely by the power of the Holy Spirit without the intervention of a man. He is the Son of the heavenly Father according to his divine nature and the Son of Mary according to his human nature. He is, however, truly the Son of God in both natures since there is in him only one Person who is divine. 99. In what sense is Mary “ever Virgin”? Mary is ever virgin in the sense that she “remained a virgin in conceiving her Son, a virgin in giving birth to him, a virgin in carrying him, a virgin in nursing him at her breast, always a virgin” (Saint Augustine). Therefore, when the Gospels speak of the “brothers and sisters of Jesus”, they are talking about the close relations of Jesus, according to the way of speaking used in Sacred Scripture. 100. In what way is the spiritual motherhood of Mary universal? Mary had only one Son, Jesus, but in him her spiritual motherhood extends to all whom he came to save. Obediently standing at the side of the new Adam, Jesus Christ, the Virgin is the new Eve, the true mother of all the living, who with a mother's love cooperates in their birth and their formation in the order of grace. 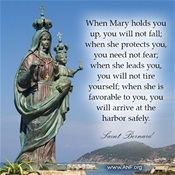 Virgin and Mother, Mary is the figure of the Church, its most perfect realization. 101. In what sense is the life of Christ a Mystery? The entire life of Christ is a revelation. What was visible in the earthly life of Jesus leads us to the invisible mystery of his divine sonship: “whoever has seen me has seen the Father”(John 14:9). Furthermore, even though salvation comes completely from the cross and the resurrection, the entire life of Christ is a mystery of redemption because everything that Jesus did, said, and suffered had for its aim the salvation of fallen human beings and the restoration of their vocation as children of God. 102. How did God prepare the world for the mystery of Christ? God prepared for the coming of his Son over the centuries. He awakened in the hearts of the pagans a dim expectation of this coming and he prepared for it specifically through the Old Testament, culminating with John the Baptist who was the last and greatest of the prophets. We relive this long period of expectancy in the annual liturgical celebration of the season of Advent. 103. What does the Gospel teach about the mysteries of the birth and infancy of Jesus? At Christmas the glory of heaven is shown forth in the weakness of a baby; the circumcision of Jesus is a sign of his belonging to the Hebrew people and is a prefiguration of ourBaptism; the Epiphany is the manifestation of the Messiah King of Israel to all the nations; at the presentation in the temple, Simeon and Anna symbolise all the anticipation of Israelawaiting its encounter with its Saviour; the flight into Egypt and the massacre of the innocents proclaim that the entire life of Christ will be under the sign of persecution; the departure from Egypt recalls the exodus and presents Jesus as the new Moses and the true anddefinitive liberator.